I've been neck deep in Summer KALs, but I do have a finished object!! 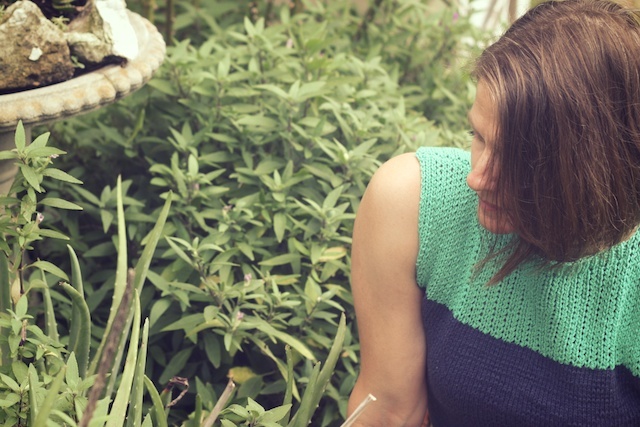 It's the Riverine Pullover, by Andi Satterlund, from Pom Pom Quarterly issue 5. That's the camping themed issue. I knit this before the continental challenge, so the body was worked on 1s and the ribbing on 0s. What fun. 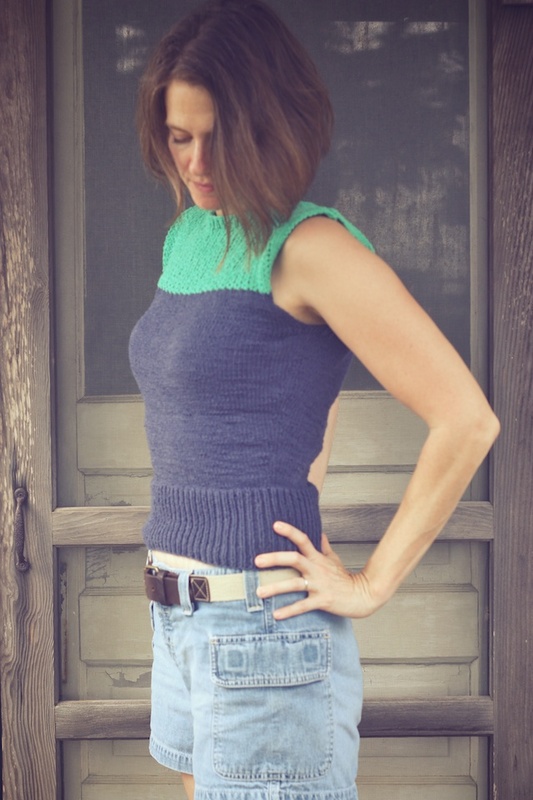 Really, it was a fun, easy summer knit. I have only one problem. It's cropped and I'm not a midriff baring kind of girl, unless I'm swimming, so I'm still needing some higher waisted pants. I knit a size small (32") using Berroco Weekend DK in dark denim and parrot green. This is as close to knitting with a neon as I have gotten. I love the way the green looks next to the dark blue. 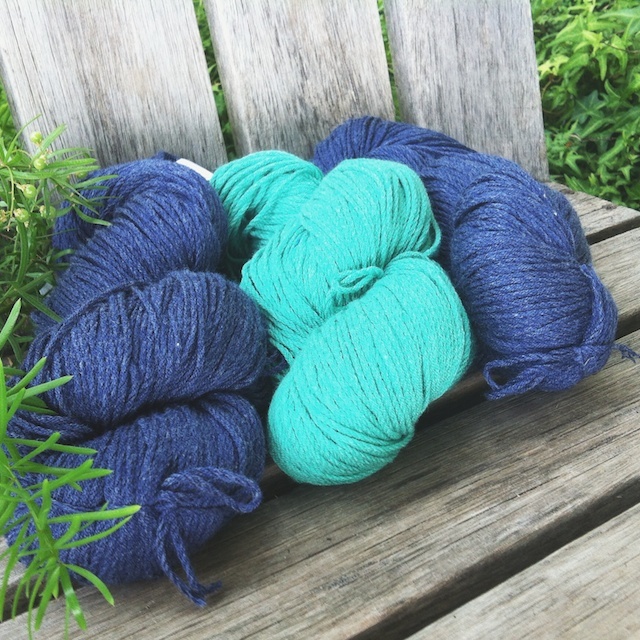 This yarn has a denim feel to it, very casual. It's actually been a few weeks since I finished it, so I'm not remembering any difficulties or mods. Nope, this was made following the directions exactly. As with Hetty, Andi's pattern was very easy to follow. She's got so many great designs I want to try. There's Aiken, the Geraldine Pullover, Chuck, and still that awesome moose vest! Other posts on Riverine: swatching and dropping needle sizes. I love this so much! Such great colors, and it looks great on you! LOVE IT! Especially your colours - really great choice! I'm not a cropped top person either, but it looks like it'd be pretty easy to lengthen if you wanted. Thanks, Jennifer! 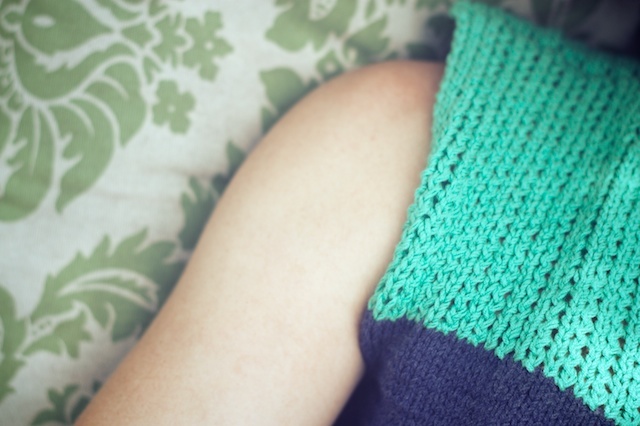 It's such a straightforward, easy summer knit. It makes me think of your Lattice Top tee that I so admired from last TTTKAL. Good idea, Katie. I love skirts, but rarely wear them. I'm taking my kids school shopping this weekend, so maybe I'll get a little something back to school for me while I'm at it. Thank you, Heather. 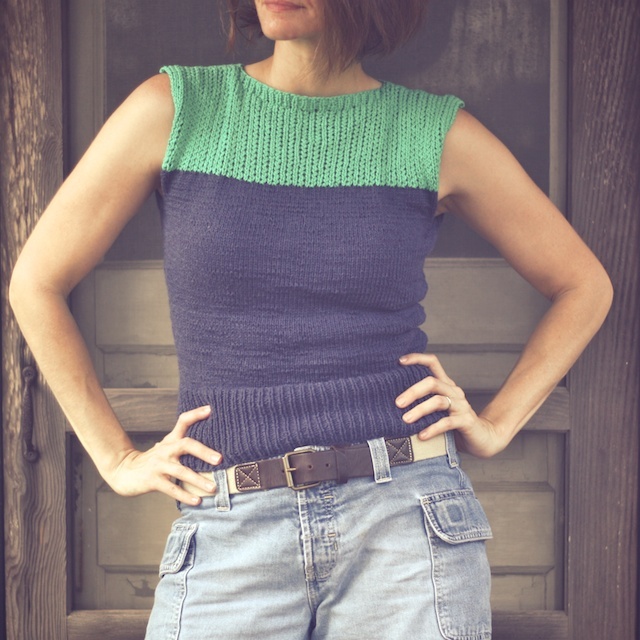 After a few years of adding an inch or two in length on all my knits it was so hard to make myself stop when directed for a cropped length. But I do like the look.